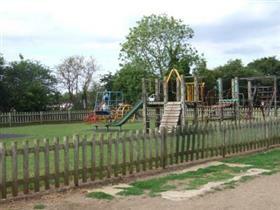 For those new to Olney or visiting, directions to the largest childen's playground - as well as the recreation fields. East Street runs parallel to Olney High Street. From the Market Place walk along the High Street, pass the Nationwide Building Society, until you reach the Carlton House Club (an imposing building set back from the road). A snicket cuts under one of the houses, next to the Cowper Memorial Church - follow it and the fields are directly opposite after you have crossed East Street.